First off, sorry for the late post. Brady is ok. He has gotten better as the day has gone on. We have to watch him to make sure he doesn't get any worse. I however am just exhausted, physically from being up at 4:30am and emotionally from having to take my child to the urgent care. I'm hoping this will be the end of doctor visits for us for a while! This week's EtsyInspired artist is one of my very favorite people and shops. The artisan behind Morgan Street is my pal Sharon. She is one of the first people I got to know on Etsy and she's an extremely nice, funny, and wonderful person. 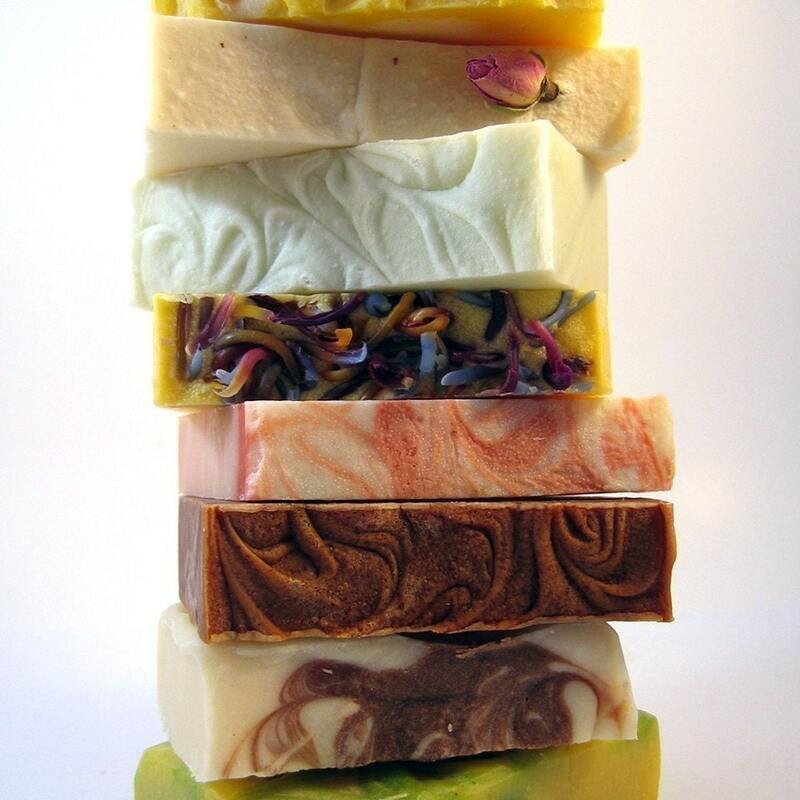 But more importantly, she makes AMAZING products! Her bar soap is the most moisturizing that I have ever found. It's luxurious and wonderfully fragrant. Plus, she has lots of other products like lip balm, scrubs, body butter, foot care, hand and nail care, and my favorite her new patisserie items! Yum! Also, she is having a HUGE sale this week with 15% off the entire store (not including Monthly Club subscriptions) AND she will gift wrap and send your gift purchases directly to your friends and family to save you the hassle! This week is a little special too! The prize is given by YOURS TRULY! :) It will be a UNITY Stamp Co single. I haven't decided which one of my precious babies to give away yet but it will be brand new and wonderful! All you have to do to be entered to win the fabulous stamp is create ANYTHING inspired by the Morgan Street shop. Take a picture of your creation, upload it to your blog or an online gallery and post the link right here on this post. Random.Brady will draw a name out of a hat. That's it! Easy! And fun! Now, go be EtsyInspired! Here is my creation based on the ChocoTherapy soap. I have this soap, it is DIVINE! I wanted to copy the shapes she used in the pictures; rectangle and circles. I made these "truffles" out of brown card stock and different colored Stickles. Also, the sentiment is hand written. No stamping! 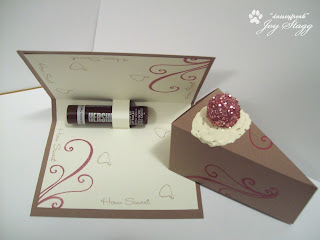 Here's Joy's way too cute lip balm holder and piece of cake! How cute is this? I love the sparkly berry on top of the cake! ADORABLE! Check out her blog for more pics! This is Tiffany's sweet little lip balm holder! What a darling little gift this makes! I love the bright and fun colors and papers she used! More pics on her blog! 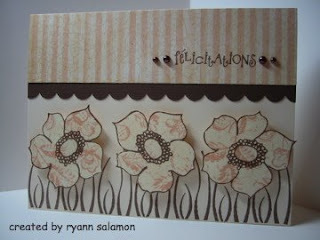 Miss Ryann made this gorgeous French card! I love the class and elegance here! I think it fits perfectly with the shop! Lee's adorable glittery lip balm holder is just too sweet! 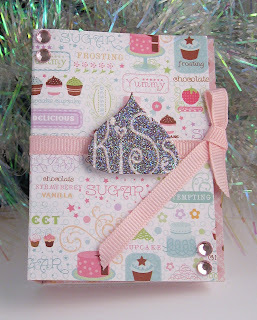 I love the glitter kiss! And the bling! And the pink! So very Lee and so very me as well! Look at Tanis's amazing bookmark! This is yet another awesome gift idea! You could give someone a book and make them a little bookmark. How darling is that? I love the colors and paper here! There's more pics on her blog. 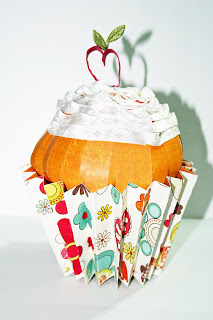 Once again, Lindsay outdid herself with this cute 3D cupcake! This would be such a cute little decoration for a party or shower! I love it! There's a close up on her blog. I'm glad you made it home. I hope Brady is okay. Email me and tell me the details. Poor kid. Super cute card. The truffles turned out so cute! Glad to hear Brady is doing a little better. i'm so glad that brady is doing better! I'm continuing to think about you guys! is this challenge for anyone, anywhere, any stamp? how about deadlines? Hope all is better with your little Brady! So glad your lil Brady is doing better!!! 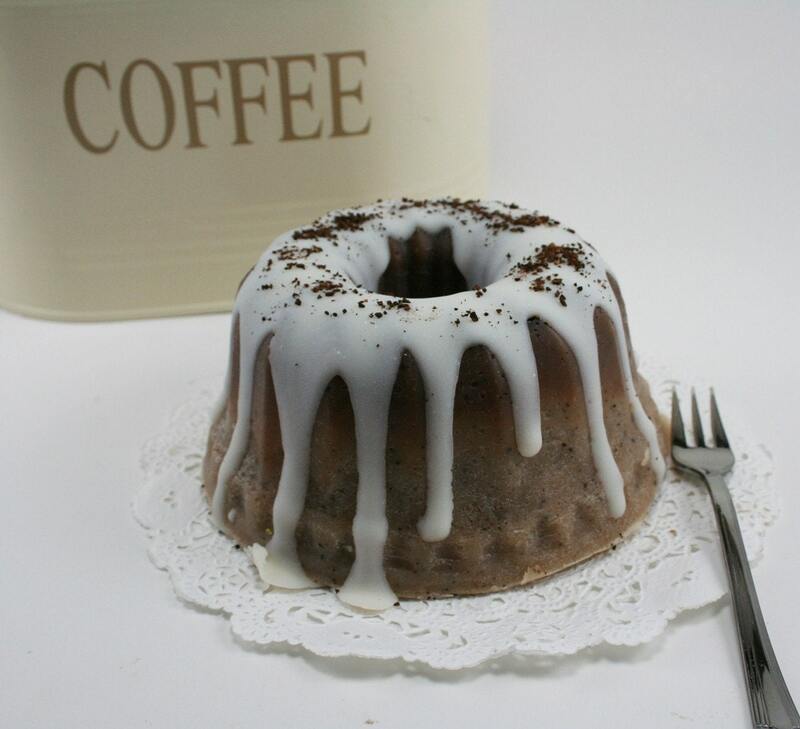 And cute, cute, cute....I gotta try making one of the cake slices!!! Ok, first timer here for the Etsy challenge. It was fun looking through the shop. Hi Ash! I tried to post last nite but I'm not sure if it didn't take or if you have to approve it first... if this is a dupe, I apologize! 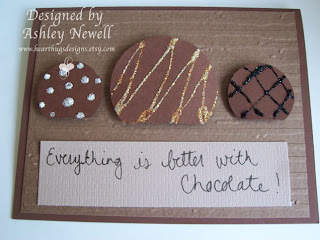 Here's my entry http://stampin-de-va.blogspot.com/2008/11/etsy-inspired-challenge-13.html. I'm so glad Brady is doing better too!